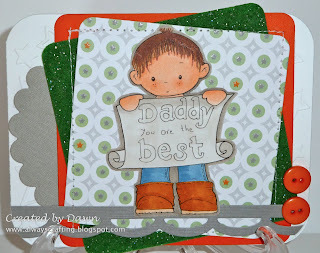 Today at Crafting for all Seasons our challenge is Father's Day. Head over the blog here to enter your project! Check out the DTs' projects while you are there too! Mami Doodles is our sponsor for this challenge! Make sure to check out my blog candy at the top of the blog! What an adorable card. I love the layout. Thanks for joining us at Aud Sentiments. Thanks for playing along at the Freshly Brewed Challenges month long prize challenge! This is adorable!! I love the layout and colors! Thanks for playing along with us at Catch the Bug! too cute! love the colors and buttons! thank you for playing this weeks bugaboo challenge at catch the bug! Soooo cute, thanks for joining us at TPS this week. Great card. Thanks for joining us at TPS. How sweet, thanks for joining in at Aud Sentiments. Great card and love the colours you have used. Many thanks for joining in with Fab'n'Funky's "What'eva" challenge this week. Oh he's such a sweetie - this is going to make someone very happy this Father's Day! Your card is just perfect for our "For a Male" challenge at Aud Sentiments. Thanks for joining us this week! Aww this is adorable Dawn.